Contrary to what the name implies, a person who is longsighted has blurred vision when looking at close objects, unless they make a constant effort to focus, which can lead to strain, headaches, and eye fatigue. 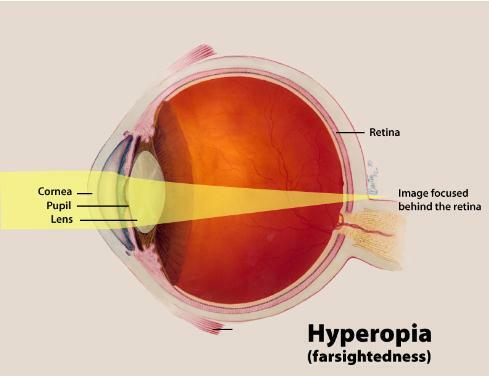 Longsightedness or hyperopia happens when the eye is shorter than normal. This shape causes images to be focused behind the retina, rather than on it. It is a common condition that most often is inherited. As a result, the lens of the eye must exert effort to focus the image on the retina. Surgery: Surgical options are available to correct longsightedness, but can be expensive and may involve more risk than corrective spectacles or contact lenses. These options use either laser technology or small incisions to reshape the cornea of the affected eye.